Review posted January 13, 2017. Hyperion Books for Children, New York, 2016. 36 pages. Hooray! A new Mo Willems book! With new characters! Mo Willems recently spent significant time in Paris, so some of his recent books have a French theme. 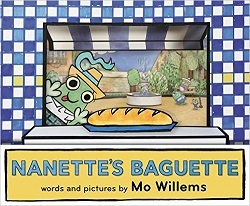 Nanette’s Baguette is a story with all the fun of any Mo Willems book about a frog who gets to go buy a baguette all by herself for the very first time. My one quibble? Frogs with teeth able to Krack into baguettes? Okay, it’s odd, but he makes it work. The book is full of –ette rhymes, and they are done well and add to the humor. Today is a day Nanette won’t soon forget. Is Nanette set to get the baguette? When Nanette gets the baguette, it indeed is warm. It indeed smells wonderful. And there sure is a lot of it…. Or at least there’s a lot of it for awhile. Nanette is beset with regret. Mom is understanding and kind. (I love that Mom’s hug is as warm and wonderful as a million baguettes.) They go back to get another baguette. But that baguette, too, is warm and smells wonderful. This time Mom is the one who’s tempted…. The illustrations in this book are amazing. A note at the back explains, “The images in this story are comprised of photographed handcrafted cardboard-and-paper constructions digitally integrated with photographed illustrations and additions.” On the back flap, there are some small pictures of Mo Willems creating it, so you can see the small village with the creator standing behind it. I was going to say that the pigeon isn’t hidden in this book – and then I found him in a clever place. So that will please Mo Willems’ many fans. Again, I’m not so sure about frogs. I wouldn’t be sure they actually are frogs except for the pictures on the wall in their house. (Teeth? Really?) But his simple cartoon characters always do work. As always, I like the way he can put so much emotion into such seemingly simple faces. And it begs to be read aloud. So much fun as it rolls off your tongue! I’m definitely using this book for my very next storytime. Nanette’s Baguette may be Mo’s best yet!